Haunted by numerous instances of forgetting school supplies, we figured an app to quickly get a hold of missing pens and paper would be both useful and feasible. Thus, dePENdable was born. dePENdable allows "Borrowers" in need of specific school supplies to connect with "Lenders" that can be contacted in order to receive said supplies. We used MIT App Inventor to put together an Android app that provides the basic functionality of our concept using phone location services. Coming up with the idea for the app was a large challenge in itself. 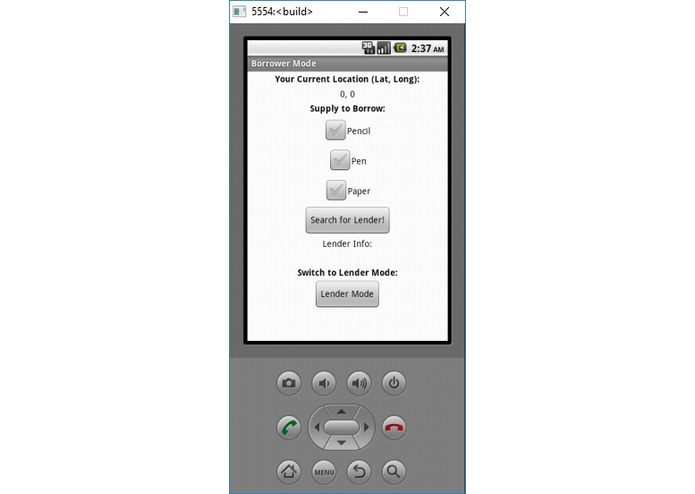 Afterwards, implementing the app using App Inventor proved difficult because the built-in functions occasionally proved inflexible and confusing to make work as necessary. Creating a decently fleshed-out, original app idea was a large point of pride among all group members. Being the first hackathon/project for all of the group members, carrying through the process from beginning to end was a gratifying experience. Creating dePENdable gave each of us insight into the intricacies of app design, even for very basic applications. Using the pre-set blocks of code provided within App Inventor forced us to think/program in ways that might differ from what we would do in a language such as Java. Integrated communication between Lenders and Borrowers, implementation of a marketplace system, live map system, further customization of supplies to be borrowed/lended. I was an active participant in conceptualizing and designing the application along with my teammates. I was responsible for most of the actual implementation and testing of the app within MIT App Inventor. I worked on the design and logic features of this program. Through careful collaboration with my team, we worked on debugging strategies and potential extensions to improve this application. I assisted in brainstorming for project ideas. I also helped to come up with the program's logic and its features.